The Copper Canyon is a landscape of raw and rugged natural beauty. Its terrain is remote and sparsely populated, which enhances the appeal. Most come to ride the 650 kilometer (400 mile) long Copper Canyon Railroad journey from the Sea of Cortez to inland Chihuahua. The train hugs the cliff rims, giving you spectacular views. 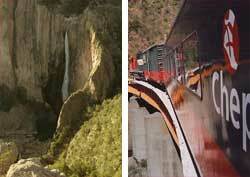 There are two types of Copper Canyon trains: The Economy Class and First Class Express nicknamed Chepe. The latter is more expensive but a better value. It leaves two hours earlier, which means more daylight sightseeing time. Moreover, it makes fewer station stops and, obviously, is more comfortable. It lies between the coastal city of Las Mochis and the "half way to Chihuahua" villages named Divisadero and Creel. The remainder of the route to the end of the line in Chihuahua is relatively mundane. The full railroad journey takes 13 to 14 hours. Therefore, if you start your trip in Chihuahua, it may be dark before your train reaches most of the best Copper Canyon sights. That's why I recommend you start in Los Mochis instead. It will be morning and midday when you pass the highlights.